For other uses, see Ras al-Ayn (disambiguation). Ras al-Ayn (Arabic: رأس العين‎, translit. Raʾs al-ʿAyn, Turkish: Resülayn, Kurdish: Serê Kaniyê‎, Classical Syriac: ܪܝܫ ܥܝܢܐ‎, translit. 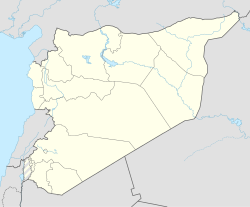 Rēš Aynā), also spelled Ras al-Ain, is a city in al-Hasakah Governorate in northeastern Syria, on the border with Turkey. 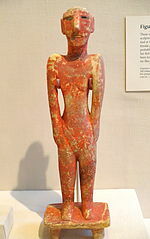 One of the oldest civilizations in Upper Mesopotamia, the area of Ras al-Ayn has been inhabited since at least the Neolithic age (c. 8,000 BC). Later known as the ancient Aramean city of Sikkan, the Roman city of Rhesaina, and the Byzantine city of Theodosiopolis, the town was destroyed and rebuilt several times, and in medieval times was fiercely embattled between several Muslim dynasties. With the 1921 Treaty of Ankara Ras al-Ayn became a divided city when its northern part, today's Ceylanpınar, was ceded to Turkey. With a population of 29,347 (as of 2005[update]), it is the third largest city in al-Hasakah Governorate and the administrative center of Ras al-Ayn District. The city is inhabited predominantly by Arabs and Kurds, with a significant number of Syriacs/Assyrians and a smaller number of Armenians and Chechens. During the Syrian Civil War of the 2010s, it became part of Jazira Canton in the de facto autonomous region of Rojava. The first mention of the town is in Akkadian "Rēš ina" during the reign of the Assyrian king Adad-nirari II (911-891 BC). The Arabic name "Ras al-Ayn" derives from the Akkadian and has the same meaning: "head of the spring". Or, idiomatically, "Hill of the spring" - indicating a prominent mountain formation close to a well. The ancient Greek geographer Ptolemy (d. 168) names the town "Raisena". The town was called in the Roman empire as "Ressaina/Resaina". Another name was Theodosiopolis after emperor Theodosius I who enlarged the town in 380. In addition to "Ras al-Ayn" medieval Arabic Muslim sources refer to the town sometimes as "Ain Werda". Nineteenth century English sources refer to the town as "Ras Ain" or "Ain Verdeh" (1819) or "Ras el Ain" (1868). The Kurdish name Serê Kaniyê also means "head of the spring" or "head of the Fountain". It means water source areas in Kurdish. This name is probably a modern literal translation of the ancient Semitic name. Ras al-Ayn is located in the Upper Khabur basin in the northern Syrian region of Jazira. The Khabur, largest tributary of the Euphrates, crosses the border from Turkey near the town of Tell Halaf, just about 4 kilometres (2.5 mi) to the southwest of the city. The overground feeders, originating on the headwaters of the Karaca volcano in Şanlıurfa Province, however usually don't carry water in the summer, even though Turkey brings in water from the Atatürk reservoir to irrigate the region of Ceylanpınar. While more than 80% of the Upper Khabur's water originates from Turkey, this mostly comes as underground flow. So rather than the overground streams, it's the giant karstic springs of the Ras al-Ayn area that is considered the river's main perennial source. Ras al-Ayn has more than 100 natural springs. The most famous spring is Nab'a al-Kebreet, a hot spring with a very high mineral content, containing everything from simple calcium to lithium, and even radium. The area of Ras al-Ayn is one of the oldest civilizations in Upper Mesopotamia, inhabited since at least the Neolithic age (c. 8.000 BC). Later it became known as the ancient Aramean city of Sikkan, the Roman city of Rhesaina, and the Byzantine city of Theodosiopolis. The city fell to the Arabs in 640, was several times destroyed and rebuild, and in medieval times fiercely embattled between several Muslim dynasties. It still remained an important site of the Syriac Orthodox Christians, until Tamerlane sacked the city at the end of the 14th century. During the Armenian Genocide, the Ottomans killed 80.000 Armenians in the infamous Ras al-Ayn camps. Divided by the 1921 Treaty of Ankara, it was stripped off its northern neighborhoods, today's Ceylanpınar, Turkey. In the Syrian Civil War, Ras al-Ayn was engulfed by the long Battle of Ras al-Ayn, until in July 2013 the Kurdish YPG forces took over control and expelled the jihadists. Today the city with its predominantly Kurdish population is part of Jazira Canton in the de facto autonomous region of Rojava. Two Neolithic figurines (9000–7000 BC), gypsum with bitumen and stone inlays, excavated in Tell Fekheriye. Oriental Institute Museum, Chicago, USA. The area of Ras al-Ayn was inhabited at least since the Neolithic age (c. 8.000 BC). Today's Ras al-Ayn can be traced back to a settlement existing since c. 2000 BC, which in the early 1st millennium BC became the ancient city of Sikkan, part of the Aramaean kingdom of Bit Bahiani. The archaeological site is located on the southern edge of the mound Tell Fekheriye, around which today's Ras al-Ayn is built, just a few hundred meters south of the city center. During excavations in 1979, the famous Tell Fekheriye bilingual inscription was found. The nearby town of Tell Halaf is also a former site of an Aramean city. In later times, the town became known as "Rhesaina", "Ayn Warda", and "Theodosiopolis", the latter named after the Byzantine emperor Theodosius I who granted the settlement city rights. The latter name was also shared with the Armenian city of Karin (modern Erzurum) making it difficult to distinguish between them. The Sasanians destroyed the city twice in 578 and 580 before rebuilding it and constructing one of the three Sasanian academies in it (the other two being Gundishapur and Ctesiphon) in it. The city fell to the Arabs in 640 who confiscated parts of the city which were abandoned by their inhabitants. The Byzantines raided the city in 942 and took many prisoners. In 1129, Crusader Joscelin I managed to hold the city briefly, killing many of its Arab inhabitants. At its height the city had a West Syrian bishopric and many monasteries. The city also contained two mosques and an East Syrian church and numerous schools, baths, and gardens. Later, Ras al-Ayn became contested between the Zengids, Ayyubids, and the Khwarazmians between the 12th and 13th centuries. It was sacked by Tamerlane at the end of the 14th century ending its role as a major city in al-Jazira. In the 19th century a colony of Chechen refugees were settled in the town by the Ottoman Empire. They had left their native land after the Russian invasions. The Ottomans also build barracks and a fort for a thousand men to control and protect the refugees. During the Armenian Genocide, Ras al-Ayn was one of the major collecting places of deported Armenians. From 1915 on, 1.5 million Armenians were deported from all over Anatolia, many forced to death marches into the Syrian desert. Approximately 80,000 Armenians, mostly women and children, were slaughtered in desert death camps near Ras al-Ayn. Besides the Deir ez-Zor Camps, the Ras al-Ayn camps became "synonymous with Armenian suffering". As a result of the 1921 Treaty of Ankara, Ras al-Ayn became a divided city when its northern neighborhoods, today's Ceylanpınar, were ceded to Turkey. Today, the two cities are separated by a fenced border strip and the Berlin–Baghdad Railway on the Turkish side. The only border crossing is located in the western outskirts of Ras al-Ayn. During the Syrian Civil War, Ras al-Ayn was engulfed by the long Battle of Ras al-Ayn. In late November 2012 rebels of al-Nusra Front and the Free Syrian Army (FSA) attacked positions of the Syrian Army. During the following eight months, Kurdish YPG forces, who were present from the outset, gradually took over control and approached the more moderate FSA rebels. On 21 July 2013, the YPG expelled the jihadists after a night of heavy fighting. On 21 January 2014, Ras al-Ayn officially became part of the newly founded Jazira Canton in the de facto autonomous region of Rojava. In 2004 the population was 29,347. The population consists mostly of Arabs and Kurds in addition to a significant number of Syriacs/Assyrians and a smaller number of Armenians and Chechens. ^ a b c "2004 Census Data for Nahiya Ras al-Ayn" (in Arabic). Syrian Central Bureau of Statistics. Retrieved 15 October 2015. Also available in English: UN OCHA. "2004 Census Data". Humanitarian Data Exchange. Retrieved 4 December 2015. ^ a b c Dominik Bonatz (1 April 2014). The Archaeology of Political Spaces: The Upper Mesopotamian Piedmont in the Second Millennium BCE. Walter de Gruyter. pp. 61–. ISBN 978-3-11-026640-5. ^ a b c d e f Taylor, John George (1868). "Journal of a Tour in Armenia, Kurdistan and Upper Mesopotamia, with Notes of Researches in the Deyrsim Dagh, in 1866". In Royal Geographical Society. The Journal of the Royal Geographical Society. London. pp. 281–360, here: 346–350. ^ J. B. Bury (18 July 2012). History of the Later Roman Empire. Courier Corporation. pp. 94–. ISBN 978-0-486-14338-5. ^ Abraham Rees (1819). The Cyclopædia: Or, Universal Dictionary of Arts, Sciences, and Literature. Longman, Hurst, Rees, Orme & Brown. pp. 449–. ^ Greg Shapland (1997). "The Tigris–Euphrates Basin". Rivers of Discord: International Water Disputes in the Middle East. London: Hurst & Company. pp. 103–143, here: 127. ISBN 1-85065-214-7. ^ John F. Kolars; William A. Mitchell (1991). "A critical pressure point: The Ceylanpinar/Ras al-Ayn Area". The Euphrates River and the Southeast Anatolia Development Project. Carbondale and Edwardsville: Southern Illinois University Press. p. 222. ISBN 0-8093-1572-6. ^ a b c d e Gibb, Hamilton Alexander Rosskeen (1995). The Encyclopaedia of Islam: NED-SAM. Brill. pp. 433 f.
^ Sondhaus, Lawrence (2011). World War One: The Global Revolution. Cambridge: Cambridge University Press. p. 390. ISBN 978-0-521-51648-8. ^ Jones, Adam (2006). Genocide: A Comprehensive Introduction (PDF). Routledge/Taylor & Francis. p. 110. ISBN 0-415-35385-8.